TEL AVIV – February 26, 2019 – ActivePuzzle, an innovative technology company that develops imaginative and educational products for the early advancement of children, announced the release of the ActivePuzzle game, an interactive robotic puzzle for kids. Designed to harness children’s enjoyment of puzzles and robots, and turn it into constructive learning experiences, ActivePuzzle teaches kids STEM concepts, logic and problem-solving skills in an innovative method. Through puzzles and robots, kids maintain a sense of spatial and tactile awareness rather than the tunnel vision that accompanies standard 2D puzzles or video games. Expressing technology ideas using puzzles makes ActivePuzzle the simplest robotics on earth. ActivePuzzle doesn’t rely on coding or computer screens — simply snap puzzle pieces together to form robots. That makes ActivePuzzle a great platform for invention and innovation. ActivePuzzle is easy to get the hang of — if you can build puzzles, you can create robots. 16 puzzle pieces included: LED, motor, buzzer, voltmeter, IR transmitter, light sensor, temperature sensor, proximity sensor, potentiometer, IR receiver, logic-not, logic-and, logic-or, insulator, wave and battery. Also included are one USB cable, one wheel and one propeller. 22 puzzle pieces included: LED, motor x2, buzzer, voltmeter, IR transmitter, light sensor, temperature sensor, proximity sensor x2, potentiometer, IR receiver, logic-not, logic-and, logic-or, insulator, wave, arduino, conductor, A2D and battery x2. Also included are one USB cable, two wheels and two propellers. Each puzzle piece implements a certain function: the battery piece supplies electric power to the circuit, the proximity sensor “sees” objects, the motor drives a wheel or fan, etc. ActivePuzzle robots are based on the Braitenberg Vehicle principle: input pieces trigger adjacent output pieces. For instance, when a light sensor puzzle is connected to a motor puzzle, the motor will run faster as the light on the sensor gets more intense. 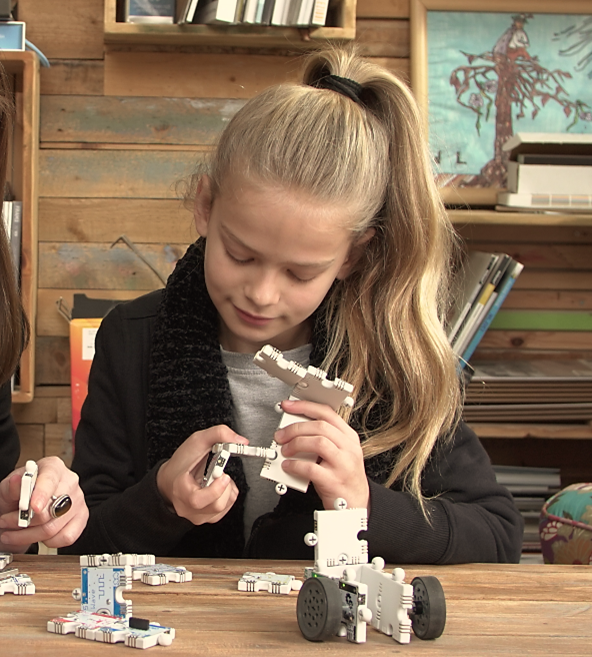 ActivePuzzle is for children aged 8+ and for those with young minds who want to build robots and to learn how they work. Additionally, educators can use ActivePuzzle to teach STEM: the game is very intuitive and simple to learn, and there are a large number of scientific and technological concepts that can be taught using ActivePuzzle. One important characteristic of ActivePuzzle is its being a gender-neutral game: the puzzle language makes girls feel natural and confident, and the game activities strengthen their self-efficacy.